In football, controversy usually surrounds the referee rather than the shirts the players are wearing. Not this week in Spain. The Spanish national team released a kit for next year's World Cup but it proved extremely divisive among the country's fans. Critics say the colours of the shirt appear similar to the flag of Spain's Second Republic, rather than the current Spanish national flag. The Second Republic started in 1931 when the King was overthrown and lasted just until 1939. The flag can evoke painful memories for those whose family members suffered during the civil war, which occurred between 1936 and 1939. The conflict was won by the nationalists and led to Francisco Franco becoming the dictator of Spain. He was in power until his death in 1975. But the Spanish football federation and designers Adidas deny the kit has political connotations. The row comes at a time of growing political divisions in Spain. What are people saying about the new shirt? Basically, the problem is the purple. Spain's flag is red and yellow. This shirt adds blue to that, in homage to the 1994 World Cup kit. But it looks purple and thereby resembles the republican flag, still used by anti-monarchists today. Javier Andrés Roldán, a law graduate from Cantabria, said that "the shirt is an insult". "I hope the football association react and don't allow us to play with these colours," he said. JuanCa wrote that the team wouldn't have his support and that he "hoped they were eliminated in the first round". 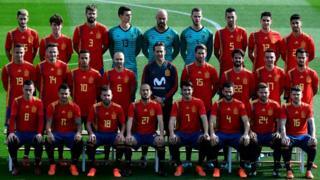 Pablo Iglesias, the leader of the left-wing Podemos party and a republican, tweeted: "It's been a while since the Spanish national team wore such a nice shirt. All together with the reds." He stoked the flames further by adding that "in 2017, a paranoid and corrupt right-wing government will end up banning colours that they do not like". "The purple [on the shirt] is not only beautiful; it also represents Spanish democratic rebellion," he said. But Spanish football expert Sid Lowe told the BBC: "The idea that this was some kind of deliberate political statement from Adidas and the Spanish football federation is ridiculous." He said: "The amount of noise this has created is baffling, although given the political context and the way in which some sort of 'debate' seems to be started every single time the national team gets together, perhaps this shouldn't be a surprise." Why has there been such a fuss? Spain is currently undergoing a sensitive political moment after an illegal referendum in Catalonia, which has laid bare some political dividing lines in the country. Opposing protesters are taking to the streets in Barcelona, Madrid and elsewhere, while the region's government has been removed and some of its leaders charged with rebellion. The main leader, Carles Puigdemont, is in exile - and citizens across Spain are considering their loyalties and asking themselves: What, exactly, is my country and what does it mean to me? So it probably wasn't the best time for something like this to happen. But in a press release on Tuesday evening, Adidas and the Spanish football federation sought to clarify that "the shirt that the Spanish team will wear during the 2018 World Cup, does not have any political connotations". The pattern is said to have been inspired by the shirt worn by the Spanish team at the 1994 World Cup in the United States. Spain's 2018 World Cup kit is red with a yellow, blue and red diamond pattern on the right side. In 1994, three bands of diamonds, two which were yellow and one navy, ran down the right side of the red Spain jersey. Getting shirty: when have football shirts become political? Last year, football's world governing body fined England, Scotland, Wales and Northern Ireland for their use of the poppy to commemorate Armistice day, deeming it to be a political symbol. They later changed their position and lifted the ban. FC Barcelona are effectively perceived within the region of Catalonia as a national team. They wear the senyera (the Catalan flag) as an alternative kit. During the 1982-83 season, Brazilian player Socrates organised his Corinthians team-mates into a political force. Brazil was under a military dictatorship at the time, and the then-captain of the Brazil national team protested in favour of democratic elections.